Zambia, once viewed as a Central African economic power house, wants to reclaim some of its former glory as Africa’s biggest greenfield copper project, Lumwana, is commissioned. Zambia’s 1964 independence saw the start of its FDI decline, which reached a crisis point in the 1990s. All the while, Chile had been allowed to streak ahead as plans to develop Zambia’s mineral-rich North West province, which forms part of the renowned African Copper Belt and houses massive copper deposits, gathered dust. The boom saw mines reopen, but now mine closure is on more investors’ lips than mine openers, Glencore, for one seeking to close its Nkana and Mufulira copper mines. But the exception the Australian-led Equinox Minerals, which flew journalists to its big Lumwana copper mine, opening last week. But sobering was his comment that no fewer than ten companies had previously tried to develop the Lumwana project – which has both copper and uranium – but fell short owing to lack of funding and changes in mining policy in the country. The Lumwana license covers 1 355 km2 and includes two major copper deposits, Malundwe and Chimiwungo, as well as 25 exploration prospects, and comes into play when at a time when major producer Codelco foresees the 2010 copper at $1,50/lb – or $3,300/t. 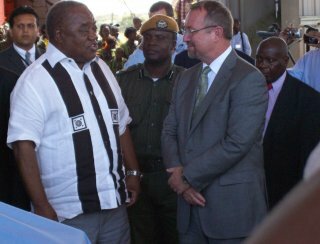 Zambian President Rupiah Banda made his mark at the Lumwana opening, marveling at the irony of the Lumwana project being commissioned while the world is still suffering in the aftermath the financial meltdown. “The opening of the Lumwana copper mine will be a catalyst for change in Zambia. It will be the economic turning point that the North Western province and Zambia needs to re-establish itself as a Central African economic powerhouse,” Banda predicted. The manner in which Zambia cut raised and then recut its mining royalty regime turned potential investors away. While Banda called for others to show the perseverance that Equinox has shown at Lumwana, it would be in Zambia’s interests to note that its copper rival, Chile, last month received a credit upgrade from Moody’s Investors Service along with a positive outlook at a time when most other countries are receiving downgrades from the same institution. “As a nation, we need to take up a mindset of perseverance because when challenges look formidable, we can mobilize ourselves and resolutely confront our challenges in order to realize that which others think is insurmountable,” said Banda. Banda praised the dedication of the former Zambian President Patrick Mwanawasa, describing the late president’s commitment to the development of the project as unwavering. He assured Equinox that the current Zambian government would display similar commitment. “The current Zambian government and the people of this country will support this investment and stand by Equinox to ensure that the Lumwana project is beneficial for all stakeholders,” said Banda. Funding Lumwana today would probably have been an extremely tough task. But Equinox began doing so in a far better capital-raising environment and Lumwana’s uranium upside assisted. In 2006, Equinox completed three rounds of equity financing totaling $250-million through a short-form prospectus equity issue managed by an international syndicate of underwriters; a private placement equity issue to Zambia Consolidated Copper Mines Investments Holdings, managed by the company; and a second short-form prospectus equity issue, managed by an international syndicate of underwriters. Equinox also announced recently that it has agreed the restructure of its credit facilities. The license is valid for 25 years, from January 2004, and is renewable for a further 25 years. Ore will be reclaimed through apron feeders onto a conveyor belt providing direct feed, at a rate of about 2 500t/h, into the SAG mill. The SAG mill trommel undersize will discharge into a hopper and will be pumped to conventional hydro cyclones, operating in closed circuit with a 26-ft × 40-ft ball mill. The hydro cyclone overflow reports to flotation, while the underflow returns to the ball mill. The Lumwana project is situated in Zambia’s North West province, which is predominantly rural. Instead of importing mine workers from developed centers such as Kitwe and Lusaka, Equinox, in conjunction with the Lumwana Mining Company (LMC), have established a comprehensive social upliftment programme, which aims to develop the immediate area surrounding the mine as well as neighboring Solwezi. “Various projects are being driven by mine bosses to build schools and libraries in Lumwana and Solwezi. Programmes are also in place to ensure that the best teachers are employed in the schools surrounding Solwezi. Ultimately, the programme wishes to encourage the advancement of literacy in the rural North Western province,” says Matoka. And the fruits of the social upliftment programme are already starting to show; a feature of the Lumwana mine is the huge Euclid DT 50 t dump trucks that transport the crushed ore to the process plant. The majorities of these trucks are operated by workers from the Solwezi district and are predominantly female. Matoka said that skills retention in the area is key, especially since the mine’s expected to produce its first tonnages towards the end of the second quarter. “There have been some enquiries to tap into the mine’s skills base especially from mines in neighboring countries. The majority of the enquiry’s are centered on the mine’s truck operators,” says Matoka. The demand for copper over the past two years has been high; this was mainly driven by demand from China and India, both going through sustained periods of urbanization. This presents Zambia with a unique opportunity to capitalize on increased demand for copper during the course of the year. With beneficiation laws requiring the bulk of ROM ore to be beneficiated locally, Zambia could look forward to a sustained period of economic growth driven by the mining industry. I guess it being the biggest copper mine in africa will make it the biggest employer in the mining sector so the locals should be enjoying new job opportunities especially that the govt restricts the use of expatriates to a minimal professional jobs only that wouldn’t be filled by locals. There’s still hope that the price of copper will shoot up again. Now that RB,someone needs to give him a lesson about his dressing,he’s trying the Mandela style but getting the wrong stuff alltogether,he looks more like he’s just come from his garden when everyone else is smartly dressed in Executive suits.